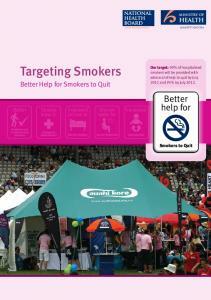 Abstract: A community antismoking campaign began in Sydney,. Australia in 1983, and in ... social network to quit smoking. .... they obtained a cluster of 10 interviews from separate .... Thus, the best estimate of smoking prevalence among. Altadis, a multinational manufacturer and distributor of cigarettes. Positive promotional efforts by that company may have played a role in the relatively. education: qualitative results from a randomized controlled trial. Brian A. Primack ... Medicine, 2Center for Research on Health Care, 3Division of. Adolescent ..... look at' a given issue in the curriculum (Table II). Another ...... Glencoe Health. Burlington, Vermont. JR Hughes. Nicotine Dependence. Center, Mayo Clinic,. Rochester, Minnesota. RDHurt. National Public. Health Institute. Department of. Promotion began calling to invite members to participate in telephone counseling. The Center ... Center for Health Promotion, HealthPartners, Minneapolis, MN. V. Kerry Smith, Donald H. Taylor, Jr., Frank A. Sloan, F. Reed Johnson, and William H. ... Marchis, Elizabeth Powell, Julia Smith, and Katherine Taylor for prepar-. aegis of a British modification of the European working ... Warlow's call for us to prove our worth belies the fact that ... Research Center on Vascular Diseases,. Abstract Prochaska and DiClemente’s stages of change concept has been readily adopted by health promoters and social marketers. These stages have been recommended as a segmentation variable in health promotion and social marketing campaigns, while a recent social marketing text proposes the Prochaska stages as a core element of the social marketing approach. For any marketing segmentation base to be meaningful, it must be shown that the different segments respond differentially to some aspects of the communication and marketing mixes directed at the segments. Hence the utility of the stages of change approach in social marketing is dependent on evidence that individuals in the various stages of change do respond differentially to elements of the social marketing mix. Given that information is the primary component of many social marketing campaigns, and that this information is often carried in the form of paid advertisements or public service announcements (PSAs), it would be useful to determine whether individuals in the different stages of change respond differentially to the same message, and hence require separate communications. 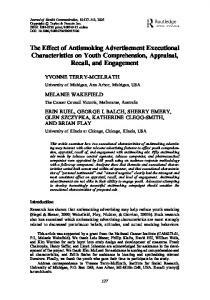 In this paper we report results from the Western Australian Health Department’s formative research with respect to which, if any, of three testimonial style ads produced in the USA would be included in the Department’s 1994 ‘Quit!’ campaign. The pre-testing was designed to assess the relative impact of each of the ads on pre-contemplators versus those in all other stages of change. 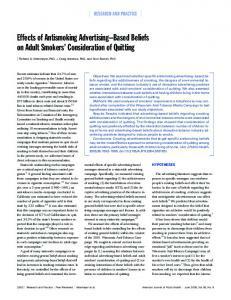 On the pre-test variables of personal relevance, believability, and impact on intentions to quit or cut down the amount smoked, contemplators and those either preparing to take action or already taking action responded significantly and substantially more favorably to all three ads than did pre-contemplators. These results indicate the potential utility of the stages of change as a segmentation variable and suggest that pre-testing of health promoting social marketing communications should be carried out against stage of change segments. 7 example, our results suggest that ‘call-to-action’ messages to pre-contemplators could stress cutting down, whereas those to later stages would emphasise quitting outright. 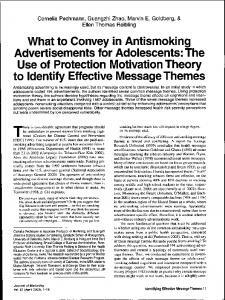 These results suggest that qualitative formative research to develop anti-tobacco campaigns should ensure that research is conducted separately on smokers in the different stages of change. Similarly, pre-testing of potential ads should be conducted against stage of change segments rather than against ‘all smokers’. Ads that might be very effective against contemplators might be rejected if tested against a sample consisting primarily of pre-contemplators. With respect to implications for pre-testing anti-tobacco advertising, it is noteworthy that substantial majorities of all stages found the ads ‘totally credible’, and that there was no difference between contemplators and those in the ready for action and action stages on this measure. Hence this measure may be a necessary, but not sufficient, indicator of an ad’s potential effectiveness. Our results suggest that personal relevance - given credibility - is a more valid indicator of potential effectiveness. Finally, this study’s findings are somewhat constrained by the need to collapse the ready for action and action stages given insufficient numbers to analyse these stages separately. Future studies would benefit by ensuring sufficient numbers in each of these stages so as to allow comparisons between all stages. Implications for Social Marketing The stages of change concept has been advanced as a core concept for developing social marketing strategies. It has been specifically suggested as a segmentation variable for defining target audiences in terms of the extent to which they appear receptive to making some behavior change. Previous research has shown that people in the different stages differ in beliefs and attitudes with respect to various health issues, and that different counselling or other interventions are more or less appropriate for people in the different stages. This study complements previous studies by indicating the potential utility of the stages of change concept for mass media communications. It also indicates that formative message strategy developmental research and pre-testing should be carried out against people in the different stages of change, rather than simply ‘all members’ of the target audience. 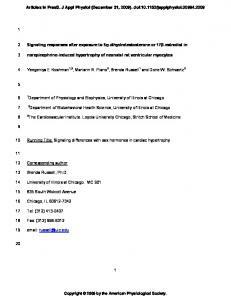 8 References Andreasen,A.R. (1995). Marketing social change: Changing behavior to promote health, social development, and the environment. San Francisco, CA: Jossey-Bass. Booth,M.L., Macaskill,P., Owen,N., Oldenburg,B., Marcus,B.H. and Bauman,A. (1993). Population prevalence and correlates of stages of change in physical activity. Health Education Quarterly, 20, 431-440. Campbell,M.K., Symons,M., Demark-Wahnefried,W., Polhamus,B., Bernhardt,J.M., McClelland,J.W. and Washington,C. (1998). Stages of change and psychological correlates of fruit and vegetable consumption among rural African-American church members. American Journal of Health Promotion, 12(3), 185-191. Curry,S.J., Kristal,A.R. and Bowen,D.J. (1992). An application of the stage model of behaviour change to dietary fat reduction. Health Education Research, 7, 97-105. DiClemente,C.C., Prochaska,J.O. Fairhurst,S., Velicer,W.F., Velasquez,M.M. and Rossi,J.S. (1991). The process of smoking cessation: an analysis of precontemplation, contemplation and preparation stages of change. Journal of Consulting and Clinical Psychology, 59, 295-304. Donovan,R.J., Jones,S., Holman,C.D.J. and Corti,B. (1998). Assessing the reliability of a stage of change scale. Health Education Research, 13(2), 101-107. Donovan,R.J. and Owen,N. (1994). Social marketing and population interventions. In Dishman,R.K. (ed). Advances in exercise adherence. Champaign, IL: Human Kinetics. Egger,G., Donovan,R.J. and Spark,R. (1993). Health and the media: Principles and practices for health promotion. Sydney: McGraw-Hill. Krugman, H.E. (1972). Why Three Exposures May be Enough. Journal of Advertising Research, 12(6), 11-14. Maibach,E.W. and Cotton,D. (1995). Moving people to behavior change: A staged social cognitive approach to message design. In Maibach,E. and Parrott,R.L. (eds). Designing Health Messages. London: Sage. Marcus, B.H. and Owen,N. (1992). Motivational readiness, self-efficacy and decisionmaking for exercise. Journal of Applied Social Psychology, 22, 3-16. Marcus,B.H., Rakowski,W. and Rossi,J.S. (1992). Assessing motivational readiness and decision making for exercise. Health Psychology, 11, 257-261. 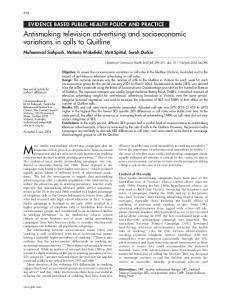 Marcus,B.H., Selby,V., Niaura,R.S. and Rossi,J.S. (1992). Self-efficacy and the stages of exercise behaviour change. Research Quarterly for Exercise and Sport, 63, 60-66. Oman,R.F. and King,A.C. (1998). Predicting the adoption and maintenance of exercise participation using self-efficacy and previous exercise participation rates. American Journal of Health Promotion, 12(3), 154-161. Prochaska,J.O. and DiClemente,C.C. (1983). Stages and processes of self-change of smoking: toward an integrative model of change. Journal of Consulting and Clinical Psychology, 51, 390-395. Prochaska,J.O. and DiClemente,C.C. (1984). The transtheoretical approach: Crossing the traditional boundaries of therapy. Dow-Jones/Irwin, Illinios. Prochaska,J.O. and DiClemente,C.C. (1986). Toward a comprehensive model of change. In Miller,W.R. and Heather,N. (eds). Treating addictive behaviours: Processes of change. Plenum Press, New York. Prochaska,J.O. and Marcus,B.H. (1994). The transtheoretical model: Applications to exercise. In Dishman,R.K. (ed). Advances in exercise adherence. Champaign, IL: Human Kinetics. Prochaska,J.O., Velicer,W.F., DiClemente,C.C. and Fava,J. (1988). Measuring processes of change: applications to the cessation of smoking. 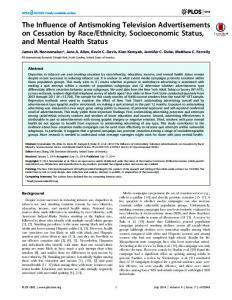 Journal of Consulting and Clinical Psychology, 56, 520-528. 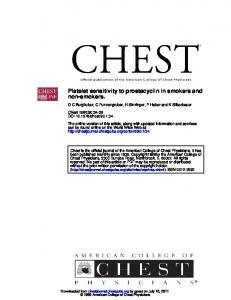 Prochaska,J.O., Velicer,W.F., Rossi,J.S., Goldstein,M.G., Marcus,B.H., Rakowski,W., Fiore,C., Harlow,L.L., Redding,C.A., Rosenbloom,D. and Rossi,S.R. (1994). Stages of change and decisional balance for 12 problem behaviours. Health Psychology, 13, 39-46. Rossiter,J.R. and Percy,L. (1997). Advertising communications and promotion management. New York: McGraw-Hill. Rossiter,J.R. and Percy,L. (1987). Advertising and promotion management. New York: McGraw-Hill. Young,E. (1989). ‘Social marketing in the information era’. American Marketing Association Conference, Social Marketing for the 1990s, Ottowa, Canada. * Lower scores indicate more favorable response. Rob Donovan, PhD, is Co-Director of the Health Promotion Evaluation Unit and a Professorial Fellow in marketing in the Graduate School of Management at the University of Western Australia. Susan Leivers is Co-ordinator Research and Evaluation in the Health Promotion Services Branch in the Health Department of Western Australia. Leonard Hannaby is Systems and Data Manager at NFO - Donovan Research, a social and marketing research company based in Perth, Western Australia. 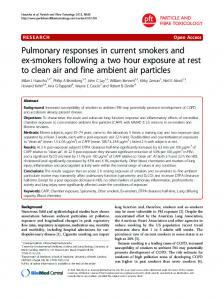 Report "1 Smokers' Responses To Anti-Smoking ..."